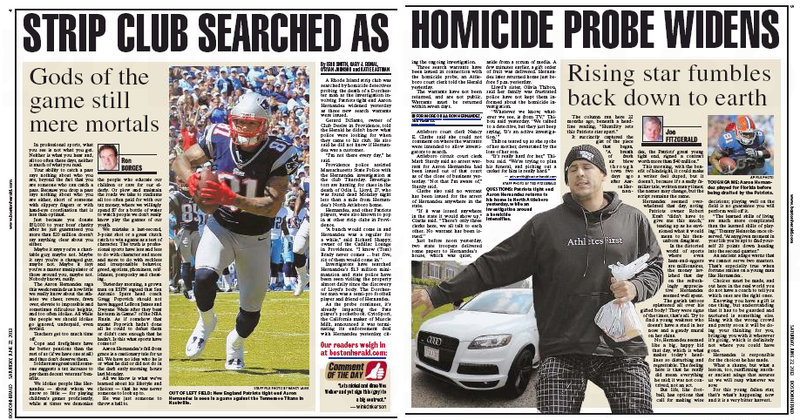 Interesting columns in Saturday’s local dailies about Boston Marathon bomber Tamerlan Tsarnaev’s short-lived boxing career. 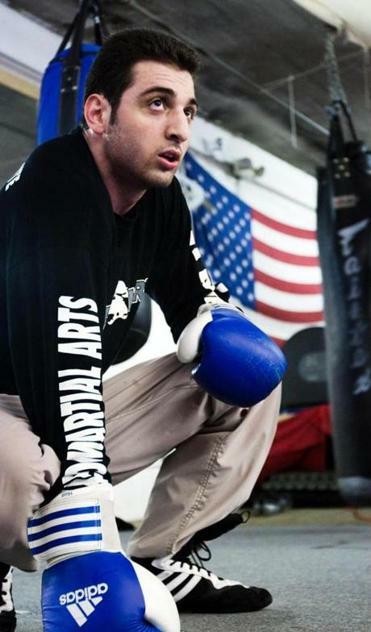 If Edwin Rodriguez knew back in late 2010 what he knows now, his boxing encounter in Worcester with Boston Marathon bombing suspect Tamerlan Tsarnaev would have had a different ending, that’s for sure. Reached yesterday afternoon, Rodriguez, the No. 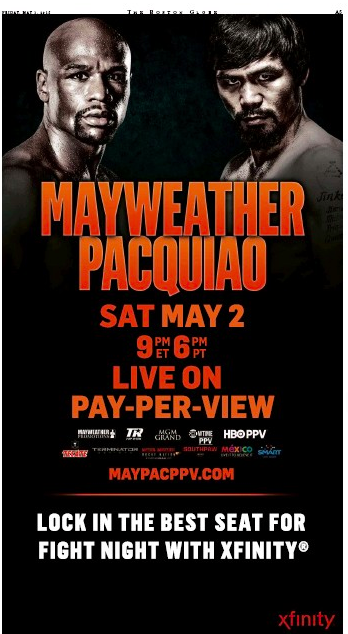 2-ranked super middleweight in the world, pulled no punches when discussing his only encounter with Tsarnaev. 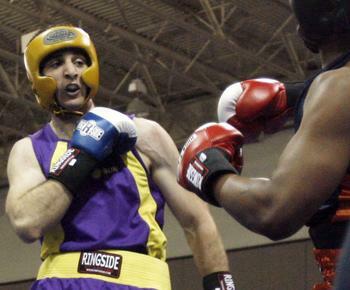 Tamerlan Tsarnaev was a pretty good boxer, and he fashioned himself a tough guy. He was so tough he was charged with assaulting his girlfriend. Last Monday, tough guy Tamerlan Tsarnaev and his brother left bombs on the sidewalk on Boylston Street and killed an 8-year-old boy, a 29-year-old woman who grew up in Medford, and a 23-year-old Chinese graduate student at Boston University. It takes a tough guy to pack a bomb with ball bearings and nails and purposely put it in a crowd so that it will kill and maim men, women, and children. The Tsarnaevs were so tough that when they decided to kill a fine police officer named Sean Collier on Thursday night, they approached him from behind and shot Collier in the head even before Collier could get out of his cruiser. 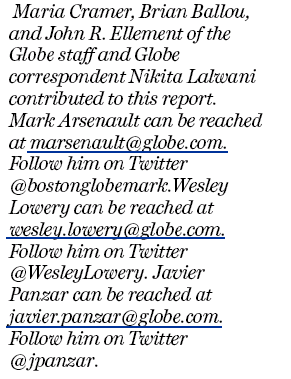 Boston journalists are fighting mad about the Marathon mayhem, no doubt about it. 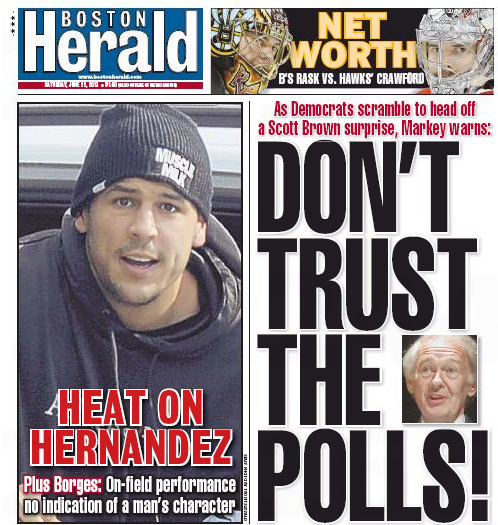 The Boston Herald is a bit bipolar in its Gronkoverage of the Patriots tight end, who broke his arm on a meaningless play in Sunday’s rout of the Indianapolis Colts. 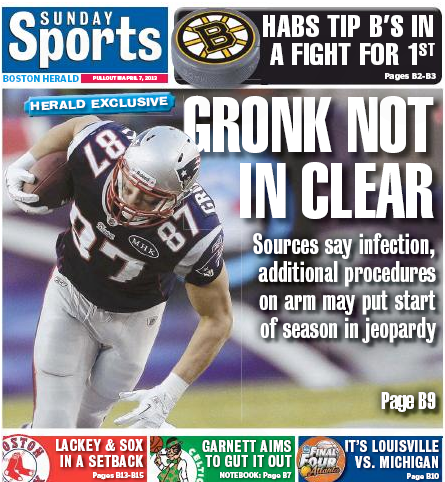 But the feisty local tabloid is absolutely sure that the Gronkastrophe deserves four full pages in today’s edition. 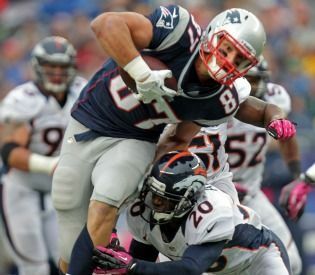 Despite the public clamor and Rob Gronkowski’s obvious determination to return as soon as he can from a broken forearm, the general consensus from medical professionals is that the 23-year-old All-Pro tight end should err on the side of caution — even if it means missing the start of the playoffs. 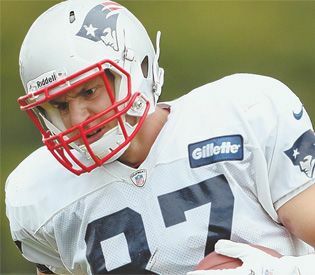 Dr. David Forsh, chief of orthopedic trauma at Mount Sinai School of Medicine, said that Gronkowski could potentially be sidelined up to eight weeks. Even when the tight end gets his cast off, he could be delayed with more rehabilitation to get his range of motion and strength back. The print edition has a swell illustration with all kinds of medical claptrap to obsess over. 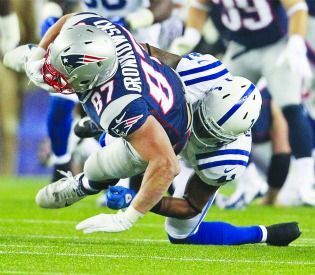 FOXBORO — Sunday afternoon, Rob Gronkowski ran over, around and past hapless Colts players, debilitating Indy with his full arsenal of skill, brawn and athleticism. Today, those are mere highlights to a Patriots [team stats] team and fan base that now must bear life without their All-World tight end. 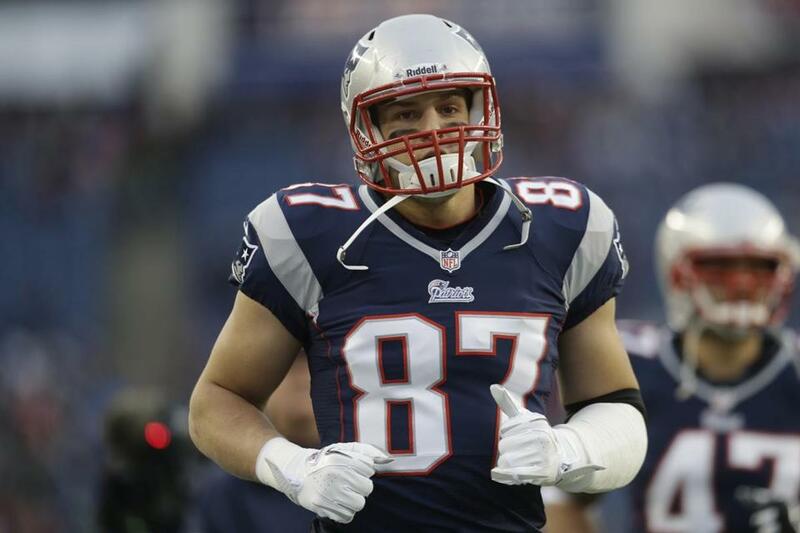 Gronkowski had successful surgery yesterday morning and had a metal plate inserted into his broken left forearm. He told people Sunday night that he would miss 4-6 weeks, according to sources, and a separate source said he would miss “a few weeks” after yesterday’s procedure. Unless there’s a drastic change, those sources all believe he’ll be back for the playoffs. 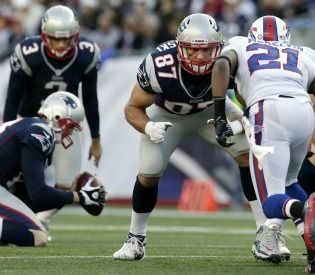 FOXBORO – The argument that Rob Gronkowski should not have been on the field when he broke his forearm blocking for an extra point because his team was leading by 34 points Sunday is a specious one. The argument that he should not be blocking for extra points and field goals at any time is not. The news broke one hour and 43 minutes after the forearm did. From the parking lots to the private boxes, from barrooms to living rooms, Patriots [team stats] fans were in a panic. Did you hear? Gronk was down. Gronk was out. 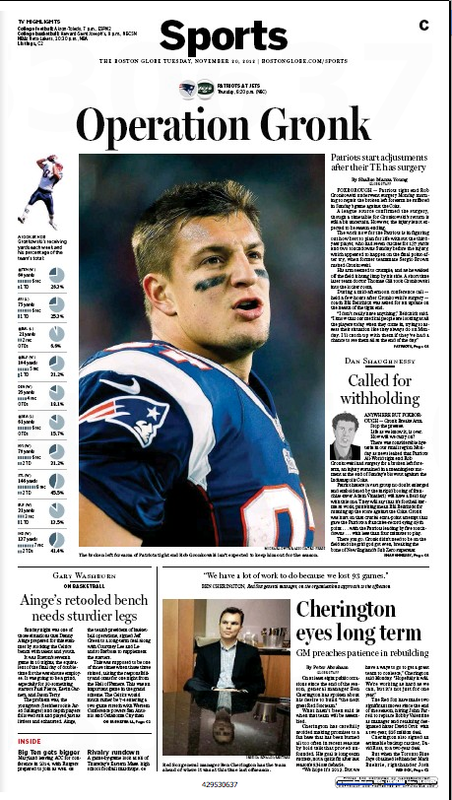 The news was bad, real bad: Gronk broke. Just like the hardreading staff’s patience with this story. 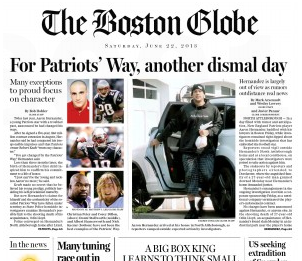 Regardless, we dutifully trundled crosstown to the Boston Globe to see if they’d developed more of a sense of urgency than they exhibited yesterday. 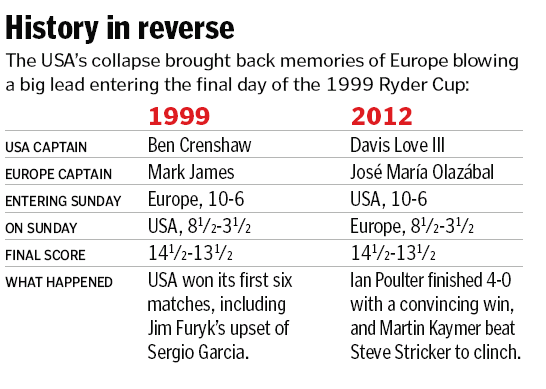 Here’s how Monday’s Boston Globe reported the throat-grabbing collapse of America’s Ryder Cup team on Sunday, after it had built a supposedly insurmountable 8 1/2 – 3 1/2 lead over the European squad. MEDINAH, Ill. — Move over, Brookline, and make room for Medinah. There’s a new location that forever will be locked in Ryder Cup lore. 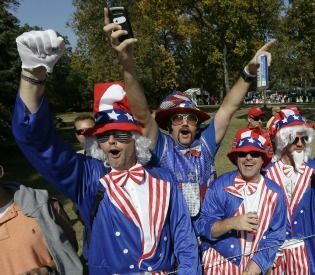 Turning the tables on a day from 13 years ago that still stings, Europe staged the greatest comeback — or benefited from the biggest collapse, depending on your perspective — in Ryder Cup history, pulling off a victory just as improbable as the one grabbed by the United States at The Country Club in 1999. Just as emotional, too, at least to the Europeans, who sang and danced and hugged and sprayed champagne over their fans from a bridge near the clubhouse when it was over. Keeping former Ryder Cup icon Seve Ballesteros close to their hearts all week — and wearing his image on their sleeves Sunday — the Euros would have made the late Spaniard proud, somehow finding a way to win when the situation 24 hours earlier seemed hopelessly lost. 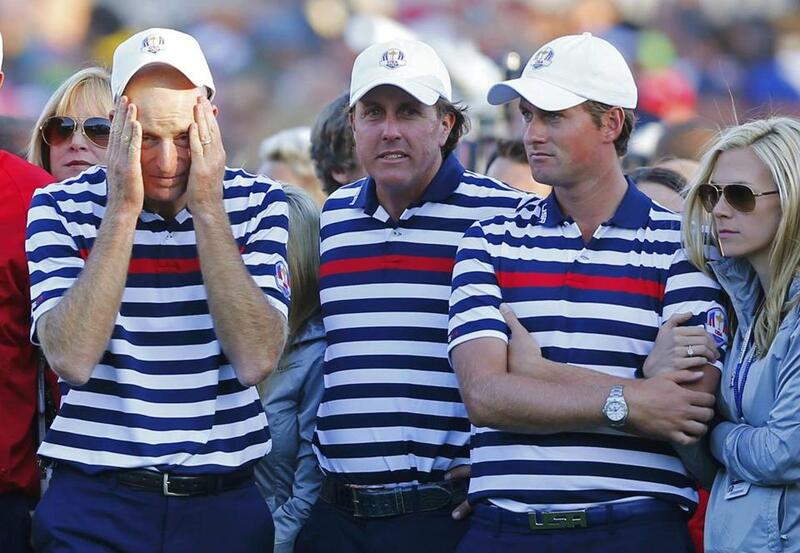 MEDINAH, Ill. — For the European team to win the 39th Ryder Cup competition today it won’t take a comeback. It will take a resurrection. The Euros find themselves buried in a deeper hole this morning than the Greek economy. They don’t need a bailout plan. They need a concession speech. Actually, Ron, you need a concession speech.